Udaipur : A leopard created panic when it strayed into an residential suburb area in Chittorgarh in the early hours of Thursday. The wild cat was spotted on the terrace of a house around 5.45 pm by a resident in KarniMata Kheda of Kumbha Nagar sub-urban area when he had gone out to buy milk. 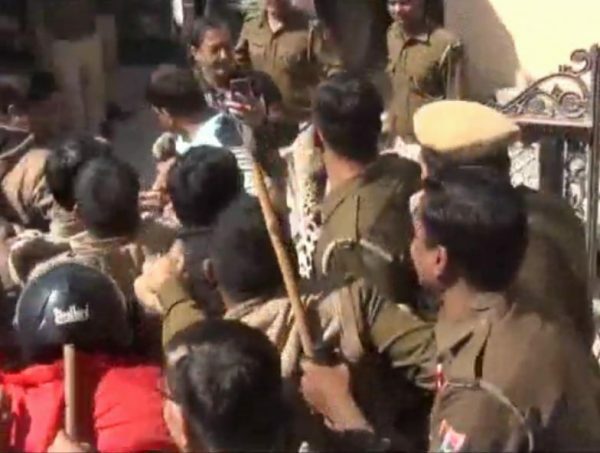 The leopard’s presence shocked the locals who were terror struck and came out on roads after the news spread like fire. The police and forest department was informed which rushed to the spot. Later, after a five-hour long rescue joint operation, officials managed to tranquilize the big cat with a dart. According to sources, the leopard was spotted in a nearby village Dhanetkala on wednesday night and perhaps it came to the city in the wee hours. This is the second time when a leopard had entered residential area. On December 30, a wild cat had similarly sneaked into the Kotwali police station of the city. According to forest officials, pugmarks of the leopard was seen in the bathroom of a house owned by a physical training instructer Durgesh Sharma in Karnimata Kheda colony. 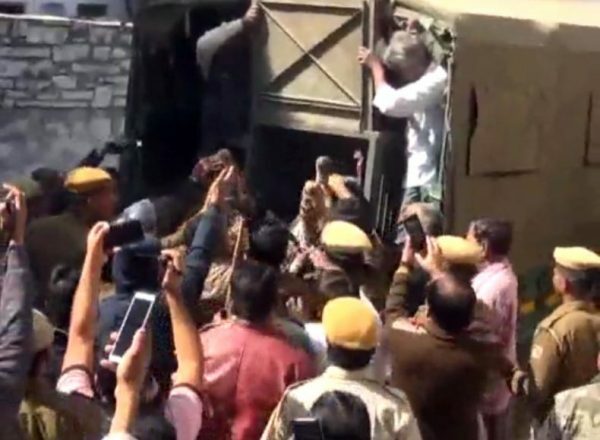 A large crowd collected in the area thus frightening the leopard which jumped over the 8-feet high boundary wall of Sharma’s house and hid itself amid some drums in the adjacent plot. The rescue team covered the plot with net to trap the cat and prevent it from getting out. The only shooter and tranquilizing expert in the division Satnam Singh was sent from Udaipur to control the leopard. 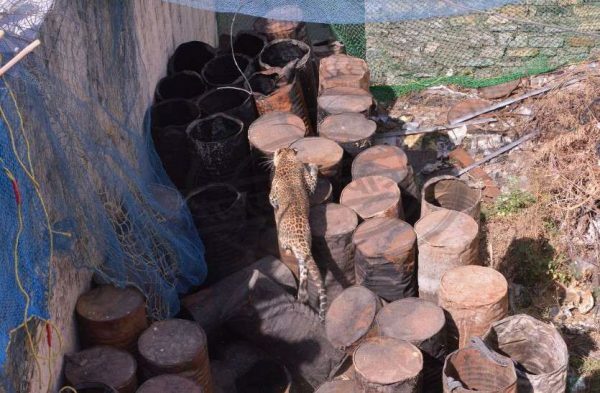 Around 11.45 am the wild cat was tranquilized and later taken away by the forest department. 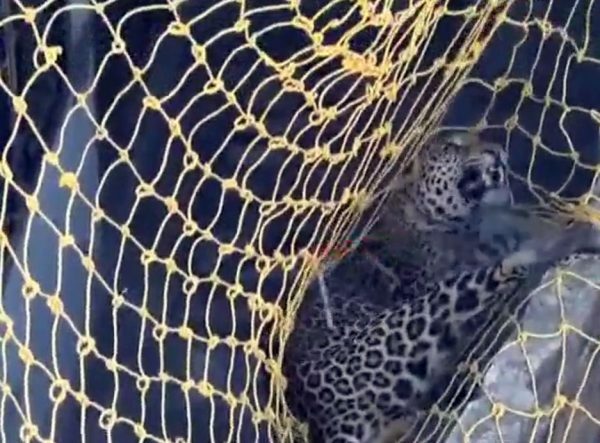 Through the entire rescue process, people stayed on the terraces of their homes out of fear and sighed relief only after the leopard was caged. A team comprising of some 150 personnel led by DFO Shashikant Pathak, Additional SP Vipin Sharma, SDM Vinod Chowdhary, SHO Sadar police station Navneet Vyas,ACF , Bassi Jagdish Dahiya, Ranger BhimSingh held the operation.